Samsung’s latest feature smartphone leaks ahead of schedule. The new Galaxy device is called the Samsung Galaxy Music which will be a music-centric budget phone that will have dual-physical stereo speakers on the front panel. For the specs-enthusiasts, the Galaxy Music will sport a single-core 850 MHz (Galaxy Y range) processor with 3-inch QVGA range (320x240). Memory-wise, it’ll have a 512MB RAM which will be paired with an internal 4GB storage. Ofcourse, being a music phone, the device will definitely have an expansion slot. 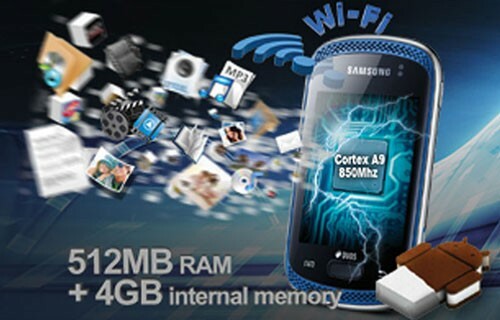 Other specs include 3MP shooter with WiFi, Bluetooth and micro-USB connectivity. And what’s more interesting is that the Galaxy Music was included in the shortlist of Sammy’s devices that will receive Jelly Bean update. In the meantime, it’ll have ICS out of the box. 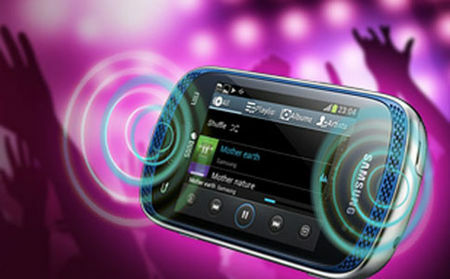 The Galaxy Music will be in a single-SIM and dual-SIM variants.